I was thrilled to be back at The Old Parish Rooms, Rayleigh for Helen and James’s wedding and also really excited about working with Kate from Blume Florist. The flowers they had for the wedding were absolutely gorgeous and being an ex-florist I’m always interested to see what the happy couple are having. 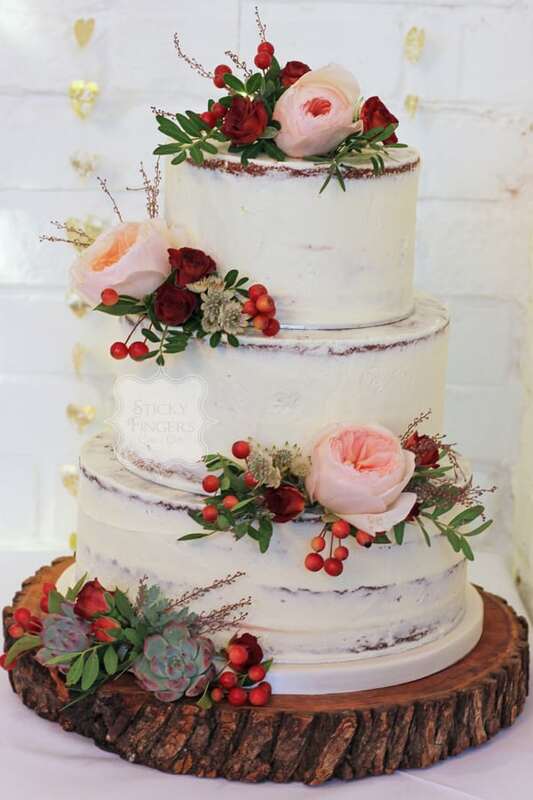 So, Helen and James decided on a semi naked wedding cake which I decorated with “Juliet” David Austin roses, burgundy spray roses, Astrantia, berries and succulents – so happy with the way it looked – Loved the twinkly lights in the background too! Yummy flavours of Rich Dark Chocolate, Cookies & Cream and Salted Caramel sitting perfectly on our log cake stand. Huge congratulations to you both. Hope you have a long and happy life together.